Macrobiotic Asia > Household Goods > Skin Care > OrBS Yumemihada "Skin Base Water & Perfect Essence set"
OrBS Yumemihada "Skin Base Water & Perfect Essence set"
Prices can be converted into your currency. 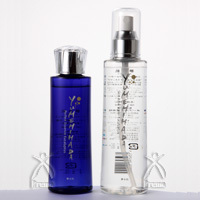 OrBS's "Yumemihada" series: clear, soft skin is yours, with highly refined eucalyptus oil and pure water from OrBS Ltd.
OrBS Ltd. is a company that researches the role of water in living skin cells. The skin’s softness depends on the percentage of water stored in skin cells, and skin clarity depends on the density of that water. The Yumemihada series was developed on the basis of this research and using OrBS water. OrBS pure water density is as high as that of the skin. It permeates your skin meaning cells retain their full moisture content. This is a regimen that incorporates such concepts as Zen, Feng-Shui, Yin Yang and Tao. These concepts unify the essence of Japans spirituality and outlook on the Universe.. The purpose of the Macrobiotic Asia website is to bring together products from Nature''s bounty as well as processed products and deliver them to the world in the Japanese spirit of harmony. We strive to provide unequaled service and quality in delivering our products to customers all around the world. Click here to see what credit cards you can use with PayPal. Copyright© since 2010, Prema Inc. All rights reserved.